Grogged white clay, porcelain slip, underglazes, clear glaze, used plastic spectacle frames. Slab built and single fired. Painting begins as soon as form takes its own weight. Glaze is painted on last. Spontaneous approach with build up of colour and glaze, exposed areas and variations in glaze depth and coverage. 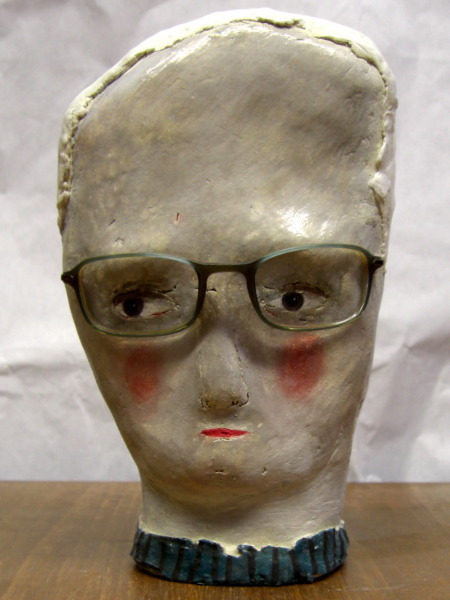 "I make heads and faces using ceramic materials. All the pieces are slab built; typically they have a front a back and a base. I roll out a slab of clay and start to draw the face, responding to the shape of the slab and looking at my own face in the mirror and various other collected images for reference. Once I have settled on my shape for the front I cut an identical slab for the back of the head. After drying for a few hours these will be ready to join together. As soon as they will stand I start to paint, sculpt, carve and manipulate the face into its 3-D form. At some point during this process when I've settled on a successful form I'll add the base. As the head starts to take shape I often amputate, cut open or scrape back areas that aren't working. Once dry, I glaze the heads and single fire them to around 1080 degrees. In the case of In the Frame, holes where made for his glasses pre-firing and after firing the glasses were glued into his head."